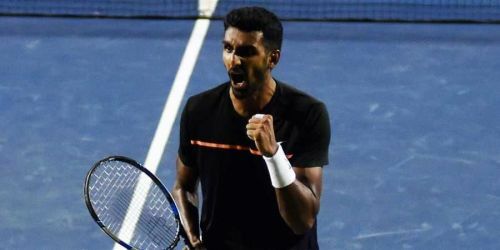 The first day at the Indian Wells Masters was quite an interesting one with some notable names taking an early round exit, the important one being India's lone singles star Prajnesh Gunneswaran beating the Frenchman Benoit Paire in the first round 7-6(5), 6-4. Currently ranked 97 in the world, this was Prajnesh's best result till date in an ATP tournament. He is all set to face the in-form Basilashvilli in the second round. Another rising star and a finalist at the Rio Open 2019, Felix Auger Aliassime is all set to face Stefanos Tsitsipas in the second round tomorrow. Mischa Zverev lost his first round match to Martin Klizan and missed the opportunity of facing his younger brother in the second round. The Australian who defeated Roger Federer in the 4th round of US Open last year, John Millman was defeated by Jan-Lennard Struff 1-6, 3-6 in the first round of Indian Wells. Coming to Day 2, Stan Wawrinka is all set to start his battle against Dan Evans in the first round. This is going to be an enthralling contest of two single-handed backhands as both the players are trying to regain the lost momentum in their respective careers. Nick Kyrgios, who looks to be in great shape, is going to play Philipp Kohlschreiber in the second round and if he wins this, he will be playing Novak Djokovic in the third round. There are some interesting encounters in men's doubles this time around as Novak Djokovic is pairing up with the Italian sensation Fabio Fognini. They are set to play their first round match against the pair of Jeremy Chardy and Milos Raonic. Another interesting pair-up is that of Indian doubles legend Rohan Bopanna with the Canadian lefty Denis Shapovalov. They are going to face Jamie Murray and Bruno Soares who are the No. 2 seeds in the doubles circuit. After a successful hip implant, Bob Bryan started his 2019 campaign with Mike Bryan and won the Delray Beach Open which is an ATP 250 tournament happened in Florida. Day 2 is lined with some interesting singles tie-ups and some captivating doubles matches, featuring some new pair-ups which should be a must watch.